One of America’s biggest marketplaces for guns is also a hub for selling Ku Klux Klan and Nazi merchandise, and a leading anti-hate group is calling for the site to change its policies. NBC 4 New York's I-Team has discovered GunBroker.com, which bills itself as the world’s largest gun auction website, also has hundreds of listings for items that have long been banned from sites like eBay and Amazon. Among the current listings: a KKK officer robe “in pristine condition” for $350, a new KKK Gut Hook Neck Knife laser engraved with “Brotherhood of White America” for $36, and a new 3-foot-by-5-foot Nazi flag being for $7.75. 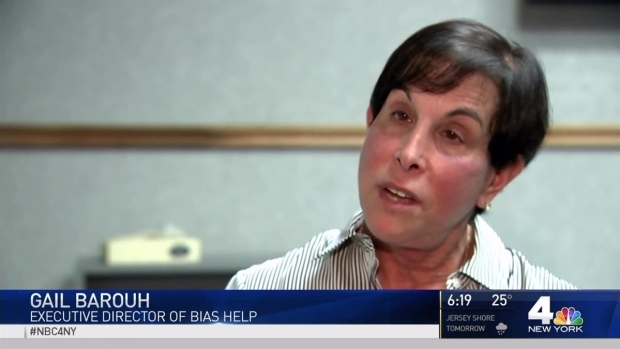 “I’m outraged, but I’m not surprised because I’m seeing this increase in the KKK everywhere that I look,” said Gail Barouh, who leads BiasHelp, a non-profit group that tracks hate incidents on Long Island. More than a decade ago, BiasHelp was among the advocacy groups that pushed eBay to stop selling KKK merchandise and other hate group gear. Last spring, Gunbroker.com was the target of criticism after George Zimmerman used the platform to try and sell the handgun he used to kill Trayvon Martin, an unarmed black teenager. Gunbroker took the ad down, issuing a statement saying, "We want no part in the listing on our website or in any of the publicity it is receiving." According to a corporate video posted online, Gunbroker.com had a robust business, with almost $3 billion in sales through 2014. According to Quantcast.com, a service that tracks clicks, Gunbroker.com gets more than 4 million visitors a month -- more traffic than Autotrader.com and almost as much traffic as Lowes.com. Barouh suggested it is irresponsible for such a high-profile e-commerce site to profit off of hate. Among the current listings on GunBroker.com: a KKK officer robe “in pristine condition” for $350, a new KKK Gut Hook Neck Knife laser engraved with “Brotherhood of White America” for $36, and a new 3-foot-by-5-foot Nazi flag being for a mere $7.75. In the past, Gunbroker.com has partnered with USA Shooting, the organization designated by the US Olympic Committee to train American athletes for shooting events in the Olympic games. Gunbroker has also sponsored a team that competed in the NASCAR Truck Series. Neither USA Shooting nor NASCAR responded to the I-Team’s request for comment before the deadline for this story. Segal said the ADL is pressing GunBroker.com to change its policies. “The first step for GunBroker.com is to create serious terms of services that say they will not allow the sale of hate on their site,” he said.